Distracted driving is a growing problem and one with serious consequences, including injury and death. 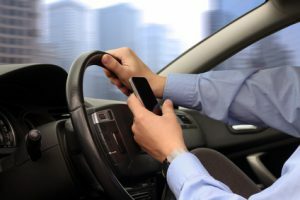 Drivers who use cell phones and other electronic hand held devices while they are driving draws are not fully attentive to their driving and surroundings, which increases the chances of a collision. Police have held traffic enforcement campaigns in order to address the issue of distracted driving in Niagara Region. When stopped by police, some drivers claim ignorance of the law or exactly how it applies to them. This information serves as an educational reminder to all drivers. What devices are considered hand held devices? In other words, any device whose primary use is not related to the safe operation of the vehicle is considered a hand held device and is illegal to use while driving. Can I use my phone on hands free mode? Hand free use is acceptable. ‘Hands-free’ use means that apart from activating or deactivating the device, it is not held during use and you are not physically interacting with or manipulating it. Can I use my hand held device if I pull over? What is the cost of using a hand held device while driving? $280 ticket. If you contest the ticket, the court may set a fine of up to $500. Drivers who endanger others because of distracted driving can also be charged with careless driving and automatically receive 6 demerit pints, fines of up to $2000 and/or 6 months in jail. You can even have your licence suspended for up to 2 years. Download the Distracted Driving 101 pdf and other resources on distracted driving here on the Niagara Regional Police Service’s website. If you’ve been injured in an accident due to distracted driving on the part of the other driver, we can help.